We use recycled paper for all our price-lists and office paper, using email where possible, we even have eco-loo roll in the staff toilets! We recycle our plastic, card, glass & paper. 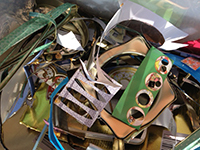 We also recycle all our off-cuts of tin and aluminium. We use local companies for our printing, packaging materials, tools, stationery and consumables; saves road miles! 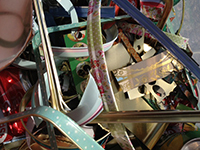 Our card gift boxes are supplied by eco-craft, a British company specializing in recycling materials. We source as many of our components as possible in the UK, saving air miles! Our silver jewellery findings are from British companies. We use radiant heaters in our studio, so we don’t heat the air which would escape through the roof and doors, we have also purchased Haramakis for staff to keep them snug in work, this helps us to be economical with our electricity consumption. And finally, last but not least, we use recycled biscuit tins, tea caddies, sweet tins, toffee and tobacco tins in our designs. Friends and family give us lots of them, especially after Christmas, and we buy more from charity shops, antique shops and ebay. So when you have a spring clean this year, don’t throw away any nice old tins, send them to us!